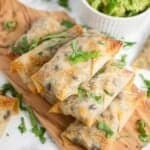 Southwest Egg Rolls are sure to be the hit of your party! 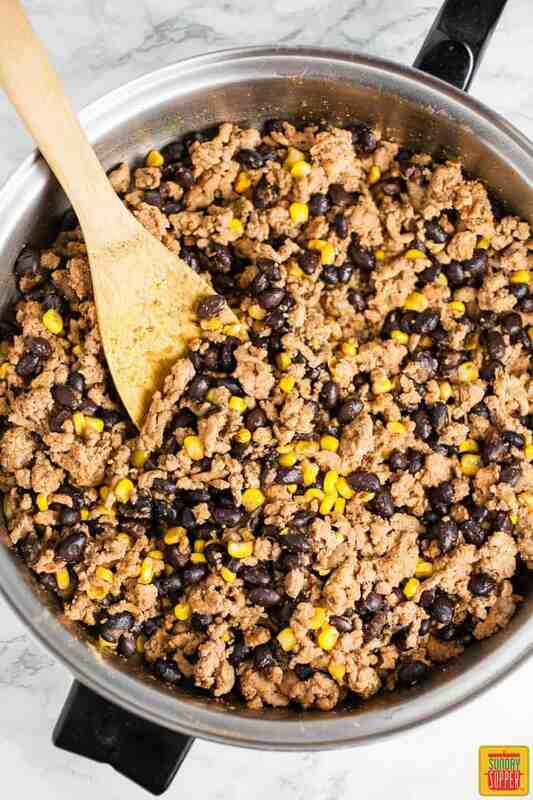 This easy appetizer recipes is baked full of spiced ground turkey, black beans, corn and served with guacamole. Admittedly, I am not into professional sports but I do love all the snacks and appetizers that go along with them. Game day fare usually consists of lots of my favorite guilty pleasures – chicken wings, mozzarella sticks, and sliders. Basically, finger foods that are dipped into tasty dips and sauces. I like to joke that I’m on ‘Team Food’. I once showed up to a Super Bowl party and chowed down on the buffet completely unaware of what teams were actually competing in the game. One of my favorite foods in general is tacos. Morphing the delicious flavor of tacos into a fun finger food sounded like the perfect experiment. And it turned out to be a successful one. These Southwest Egg Rolls are folded pockets of flavor. 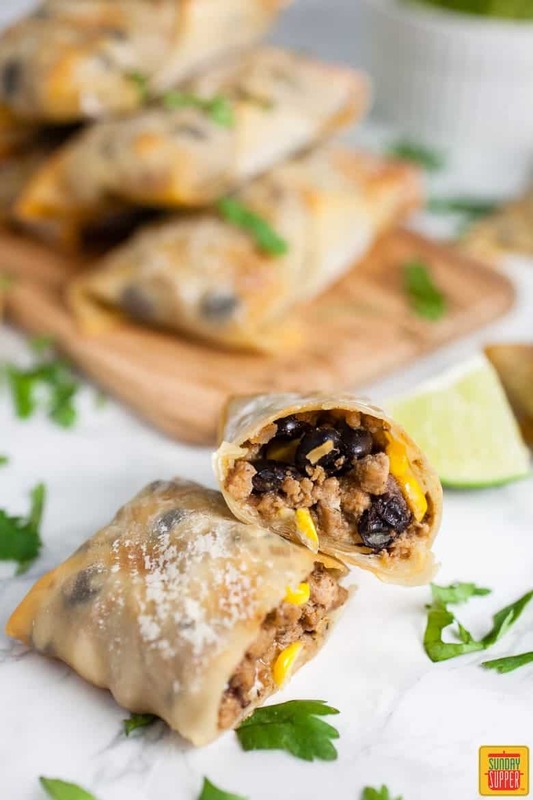 Spiced ground turkey, black beans, and corn are wrapped in egg roll wrappers, baked, and then dipped in a fresh guacamole. I guarantee that your party guests will love these egg rolls! 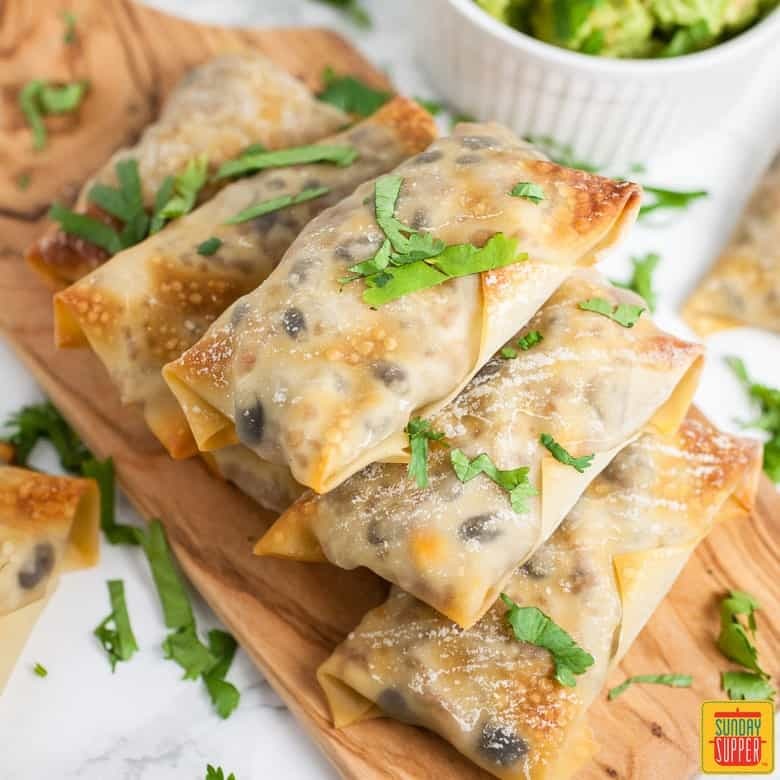 This Southwest Egg rolls recipe is so easy to make and feeds a crowd so it’s great for parties and get-togethers of any kind. It uses ground turkey as that is what I use when I make tacos at home, but ground beef or chicken would great as well. I love how the ground turkey absorbs all the flavors that are added to it. It pairs really well with Southwest spices. Begin by heating a skillet to medium and adding 1 Tbsp. of oil. Once the oil is heated add 1 lb. of ground turkey (or preferred meat) to the pan. Saute the turkey for 5 minutes or so, breaking it into smaller pieces as it cooks. As the turkey is cooking, add 2 tsp. garlic powder, 1 tsp. onion powder, 1 tsp. ground cumin, 1 tsp. smoked paprika, 1 tsp. chili powder, and a generous pinch of salt and pepper. Drain and rinse a 15 oz. can of black beans and add them to the pan. Add 1 cup of frozen corn as well. Continue to saute until the turkey is completely cooked and the corn has heated. Remove pan from heat. I’ve always been a little intimidated by the idea of making egg rolls because they seem kind of complicated but they’re really pretty simple. Especially when they’re baked because there’s no hot oil to worry about. Start by grating 1 cup of Monterrey Jack (or any cheese that melts well). Lay an egg roll wrapper out on a flat surface. Place 3-4 spoonfuls of the turkey mixture into the wrapper. Sprinkle as much cheese as you like on top of the turkey. Repeat with the remainder of the turkey, cheese, and wrappers. To wrap the egg rolls simply fold the bottom corner over the filling. Pull each side into the middle. The egg roll wrapper should look like an envelope at this point. Grab a bowl of water and dip your finger into the bowl. Wet the outer edges of the top corner and fold it down. The water will help the edges stick together. The edges should be sealed at this point. Continue with the remainder of the southwest egg rolls and place them on a baking sheet. Place all of the egg rolls onto a baking sheet. You should end up with 18-30 egg rolls so you may need more than one baking sheet. To make the tops nice and crispy I sprayed them with olive oil. You can brush the tops with olive oil as well. This kind of makes them look like they’ve been fried and gives them a nice crunch. Bake for 16-18 minutes or until the tops are slightly browned and crispy. Remove from oven when finished. Scoop 2 ripe avocados into a small bowl. Squeeze the juice of 1 lime into the avocados and add a few generous pinches of salt. Smash the avocados with a fork until all the ingredients are combined. Garnish the southwest egg rolls with cilantro and serve with a squeeze of lime. Serve them alongside the guacamole and some salsa. A variety of different salsas would be great as well. No matter what team you root for and even if you’re not loyal to any team at all these Southwest Egg Rolls will be a winner in your book! 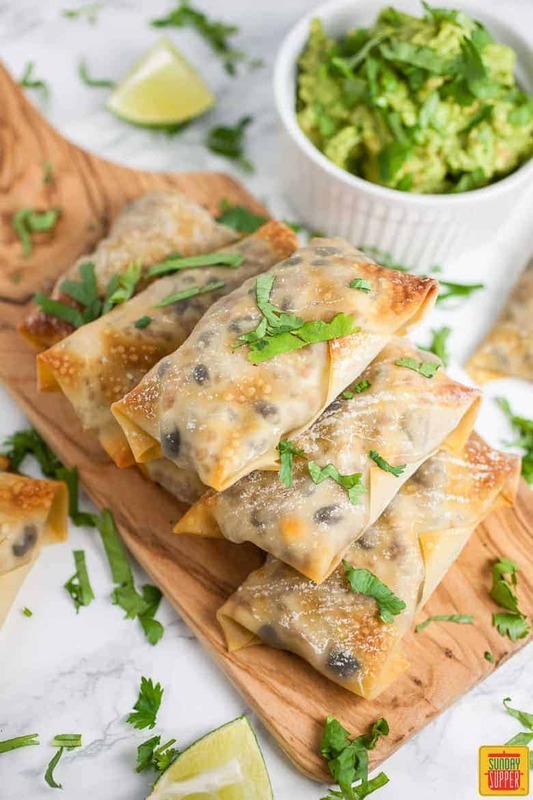 These Southwest Baked Egg Rolls are sure to be the hit of your party! 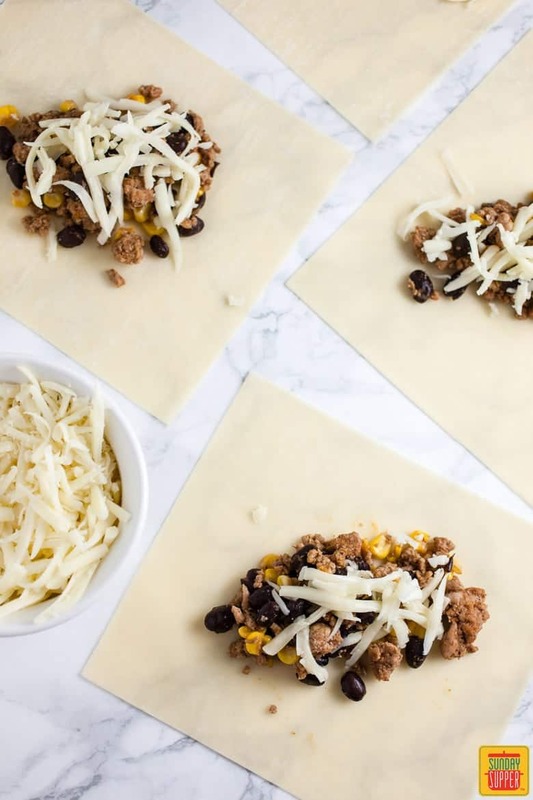 They're full of spiced ground turkey, black beans, corn and served with guacamole. Heat a skillet to medium and add 1 Tbsp. oil. Once the oil is heated add 1 lb. ground turkey to pan (can use ground beef or chicken). Saute for 5 minutes or so, breaking the turkey into pieces as it cooks. Add 2 tsp. garlic powder, 1 tsp. onion powder, 1 tsp. ground cumin, 1 tsp. smoked paprika, 1 tsp. chili powder, and a generous pinch of salt and pepper to the turkey. Stir the spices into the meat as it cooks. Drain and rise 1 15 oz. can of black beans. Add to the cooked turkey. Add 1 cup of frozen corn (can use canned or fresh) to the pan. Cook until heated. Grate 1 cup of Monterrey Jack cheese (or cheese of choice). 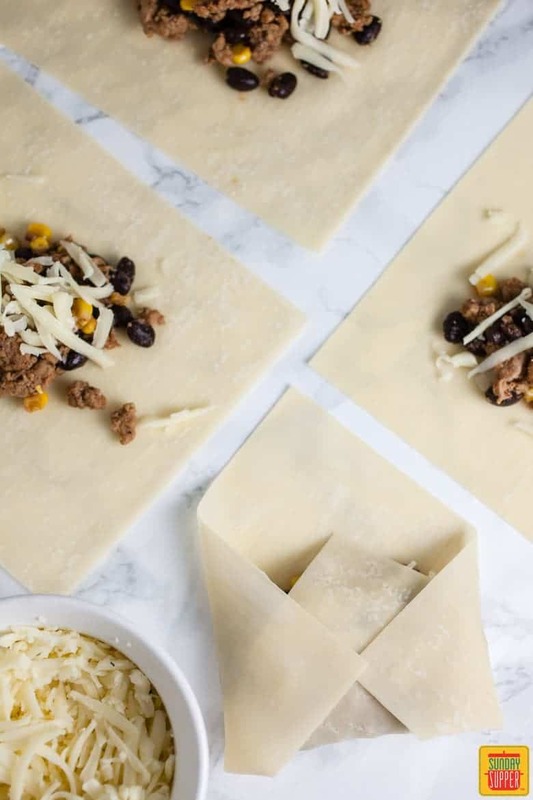 To assemble the egg rolls: Lay the egg roll wrappers out individually on a clean surface. Scoop 3-4 spoonfuls of the turkey mixture onto each wrapper. Sprinkle desired amount of cheese onto the top of the turkey. Pull the bottom corner of the wrapper up over the turkey mixture. Fold the sides in over the bottom (it should look like an envelope). Dip your finger into a bowl of water and run it along the top edges of the wrapper. Pull the top down over the folded sides and seal the edges together. 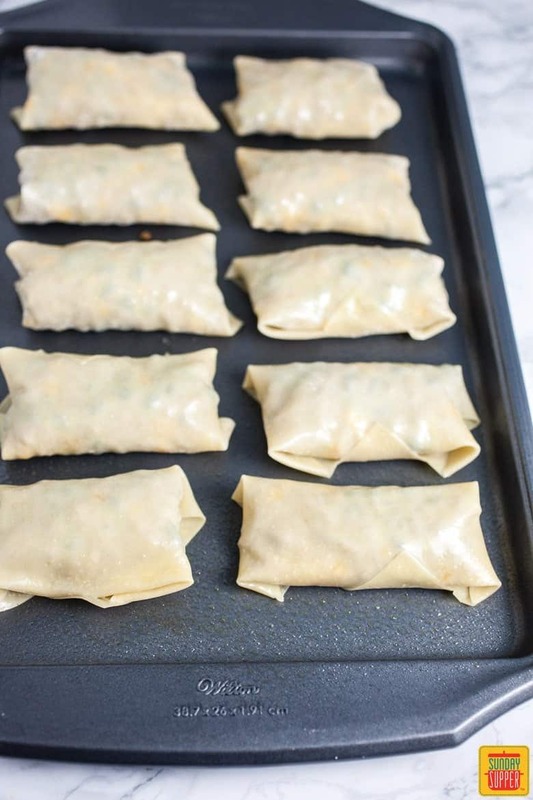 Place the sealed egg rolls onto a baking sheet(s). Spray or brush the tops of the egg rolls with olive oil. Bake for 16-18 minutes or until the tops are golden brown and slightly crispy. Remove from pan when finished. Scoop 2 ripe avocados into a small bowl. Add the juice of 1 lime and a few generous pinches of salt. Smash the avocados with a fork until all the ingredients are combined. Garnish the egg rolls with freshly minced cilantro and lime wedges. Serve with guacamole and salsa.